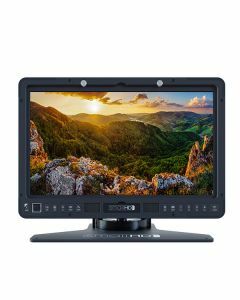 Small HD's 1703 P3 is a reference grade monitor at home either in the field on in post. Each 1703-P3 monitor comes precalibrated for DCI-P3 mastering, Covering 100% DCI-P3 with a Delta E average of 0.8. Easily install your own 3D LUT calibration with advanced color management solutions like Light Illusion's, LightSpace CMS, or SpectraCal's CalMAN. Load any 3D LUT via SD card using SmallHD’s ColorFlow 3D LUT engine. Mount Points: Multiple 1/4"-20 & 3/8"-16 Threads on Top, Bottom, Left & Right Sides. Cold Shoe Style Rails on Back of Monitor. Available Chesseplate for battery bracket mounting. Available Rapid Rail Mount Interfaces with cold shoe slots for 2 additional 1/4"-20 threads.